Bâtard is restaurateur Drew Nieporent’s newest creation. Set in the former Corton space, Bâtard brings together fabulous, eclectic food without any of the pretensions that usually accompany this level of quality. This was our first dinner at Bâtard. It certainly won’t be the last. Chef Markus Glocker and Managing Partner John Winterman bring their considerable talents to the team. Glocker’s food draws upon a wide range of influences gleaned over years spent at some of the top kitchens in Europe and the US. Most recently, Glocker ran the Gordon Ramsay outposts in London and New York. Winterman spent time at Charlie Trotter and Gary Danko before becoming maître d’hôtel at Restaurant Daniel in New York City. On a cold winter night, Bâtard is hopping. The space is open, but the room is much warmer than it was in its former incarnation. There is a palpable sense of energy from the moment we walk in through the door. It’s Friday, and that can only mean one thing. Champagne. This bottle of the 1989 Krug Collection is one of the very best I have had. The 1989 Collection is variable in quality, and quite a few examples have been on the mature side. Not this bottle. Its flavors are bright, focused and fresh for a Champagne of this age, with the classic super-fine Krug texture that invites a second glass and then a third as we look over the menu. The wild mushroom tart is really more of a deconstructed expression of a true tart, but it is absolutely delicious just the same. I am less enthused with the octopus pastrami, a dish that never seems to come together. If there is one critique of the food at Bâtard it is that everything is a bit on the salty side. Nowhere is that more evident than in the octopus pastrami. 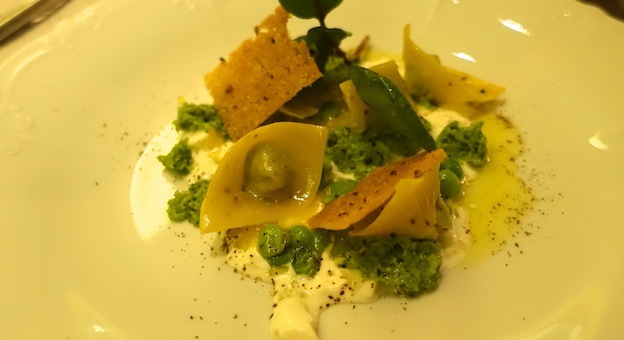 The promise of spring comes through in the English pea tortellini, which are light yet intensely flavorful and deeply satisfying. A second portion is ordered right away. I highly recommend the beef cheek ‘pot-au-feu’ for two, which encapsulates what Bâtard is all about. The flavors are rich, bold and lusty. The ‘pot-au-feu’ could be served in any dining room in New York, but the family-style presentation speaks to the pure joy of comfort food. Head Sommelier Jason Jacobeit has put together a list full of tempting options. The list is organized by price, which personally I find hard to navigate, as it is not easy to search for a favorite producer or region. Nonetheless, there are plenty of options. It has to be Burgundy. What else could it be in the space that housed Montrachet and Corton? 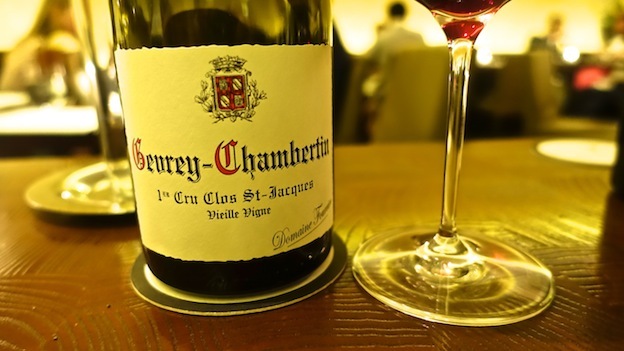 We consider Mugnier’s 2012 Chambolle-Musigny and Lafon’s 2011 Volnay Santenots but finally settle on Jean-Marie Fourrier’s 2011 Gevrey-Chambertin Clos St.- Jacques. Of course, the 2011 is much too young to drink, but finding Fourrier is next to impossible, so we can’t resist. The 2011 is deep, layered and seamless on the palate, with striking aromatics, finely-sculpted fruit and superb balance. It needs another decade in bottle, but is captivating, even at this early stage. I rarely have dessert, but who can resist rice pudding? Not me, that is for sure. Light and refreshing, the rice pudding is the perfect ending to our dinner. Readers who haven’t been to Bâtard yet owe themselves a visit. Today, there is clearly a trend towards more informal dining, driven in part by our collective desire to eat in more contemporary settings. Sadly, it is too often the case that when the reins of formality are loosened, food quality drops as well. 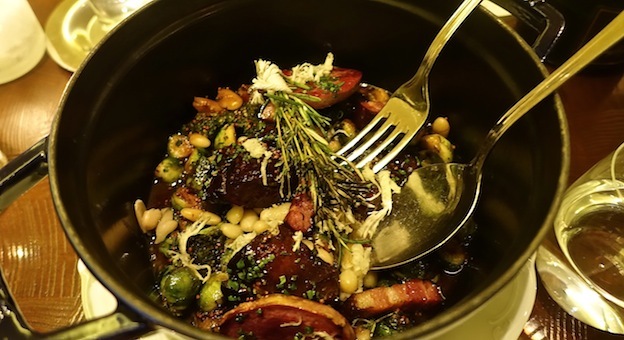 Bâtard’s version of ‘casual’ or ‘informal’ dining, however, preserves and enhances the values of top-notch cuisine, but presents them in a more welcoming environment than was the case a generation ago.